Cadbury is a British confectionery company owned by Mondelēz International Inc. and is the industry’s second-largest globally after Mars, Incorporated. With its headquarters in Uxbridge, London, England, the company operates in more than 50 countries worldwide. Cilla Black OBE (born Priscilla Maria Veronica White, 27 May 1943) is an English singer, actress, entertainer and media personality. She began her career as a singer in 1963, and is most famous in the UK for her singles “Anyone Who Had a Heart” (1964) and “You’re My World” (1964), both of which reached number one. Black had eleven Top Ten hits on the British charts between 1964 and 1971. 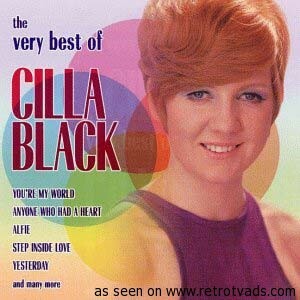 In May 2010, new research published by BBC Radio 2claimed that her version of “Anyone Who Had a Heart” was the UK’s biggest selling single by a female artist in the 1960s. “You’re My World” was also a modest hit in the United States, peaking at No.26 on the Billboard Hot 100.